Is this the Mazda RX-9 we’ve been waiting for? Mazda just showcased the RX- Vision Rotary Concept at the 2015 Tokyo Motor Show and it looks fantabulous! It also confirms that the rotary engine is still alive and would be an integral part of the next-generation RX-7 we’ve been dying to get our hands on. The RX-Vision uses a SKYACTIV-R rotary motor at its heart which allegedly revs to 8000 rpm. The exterior styling does have hints of the legendary RX-7 with a long hood and short overhangs- a coupe-like silhouette and of course, rear-wheel drive. The upcoming Mazda RX-9 is touted to be the next great sports car from Mazda and will rival the likes of the Mercedes-AMG GT, Jaguar F-Type and the likes. Mazda will be celebrating the 50th anniversary of the rotary engine in 2017 and how about a new Mazda RX-9 to mark the occasion? Well, that’s what fans of the legendary Mazda RX-7 would be hoping for. There is very little information about the upcoming RX-9 though. If we are to believe the rumors, then the RX-8 replacement that’s on the horizon could be a 450 hp sports car powered by a twin-rotary hybrid powertrain. That’s sounds pretty exciting and we can just sit and hope, for now. Meanwhile, a Japanese magazine has published a couple of images of what looks like the Mazda RX-9 we’ve been waiting for. Did the publication just leaked the new RX-9? 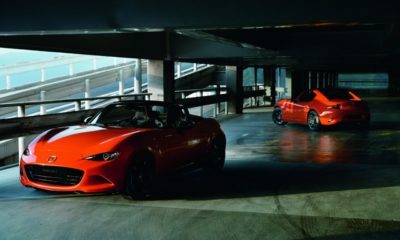 Well, it looks pretty legit and even has a familiar Mazda face borrowed from the new MX-5. The classic coupe shape and those tail lights clearly point to the RX-7 – one of Japans greatest sports cars. Mazda might reveal the new RX-9 concept at the 2015 Tokyo Motor Show. So, keep watching this space.